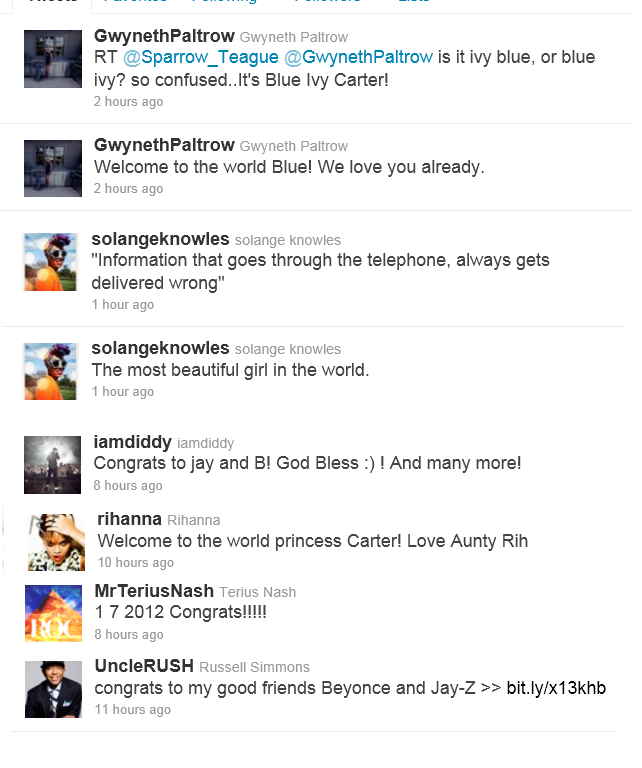 KayKiSpeaks.com: Update: Celeb friends and fam tweet congrats & the REAL name of Beyonce & Jay Z's baby! Update: Celeb friends and fam tweet congrats & the REAL name of Beyonce & Jay Z's baby! *UPDATE* We have learned from Gwyneth Paltrow (one of Beyonce and Jay Z's closest friends) that their baby's name is actually Blue Ivy Carter, not Ivy Blue Carter as earlier reports suggested! See her tweets and the congrats from other celebs after the jump! Ivy Blue Carter! Well this is being reported by E News! I dig that name. As I reported earlier Beyonce gave birth to a girl last night in New York's Lenox Hill Hospital..ironically its the same hospital LadyGaga was born! 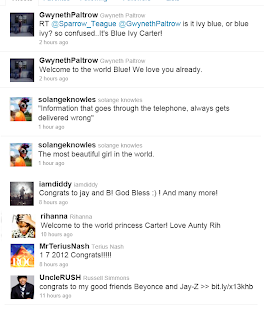 Twitter is still a blaze as the congratulatory tweets pour in..even from Rihanna..who calls the new baby..Princess Carter!